Balinese food outlets are steadily mushrooming around PJ and largely, they are managed by the same holding company. 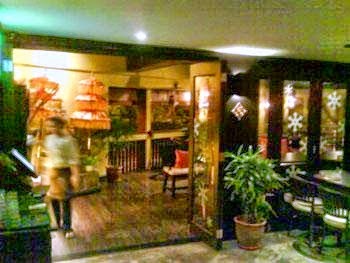 This company started with BumbuBali Restaurant in Puchong, followed by The Waterlily Café in Puchong as well; and then Ole Ole Bali in Sunway Pyramid and Solaris Mont Kiara. 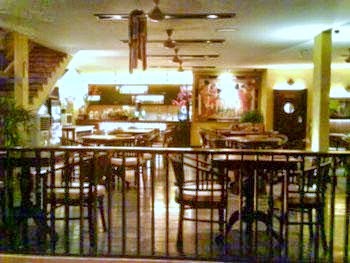 Their latest venture is The Waterlily, positioned as a Contemporary Balinese Bistro. 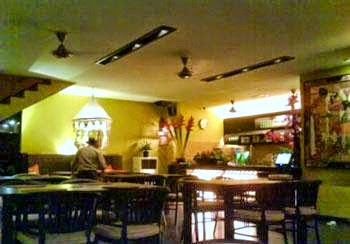 The menu covers Western (the perennial favourites of grilled meats and seafood) and of course, Balinese specialties. 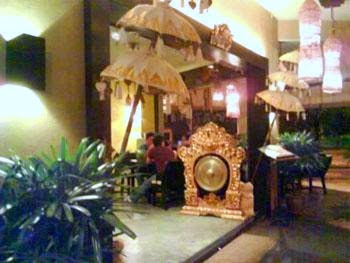 The bistro’s décor definitely lives up to its Bali theme, with plenty of Bali-inspired handicrafts, paintings, curios and decorations all over the eatery. The warm lighting adds to the cosy, resort feel. In terms of décor, the major disappointment comes from one of the most important things – the signboard. It was bordering on “cheesy”. The bistro spans two floors and the upper floor provides a more private dining area, while the lower floor is more of an “open” concept (aka no walls or door at the entrance). The restaurant is located on the corner lot and parking is a non-issue, at night. In the afternoon and early evenings, that area might get a tad busy, as it is right beside a tyre shop and a few doors away from Jaya Grocer and 7-11. As for the food, it is on the pricey side. Each person would have to fork out between RM30 and RM40 for a meal with a drink. But when you factor in the ambiance and food portion, it is reasonable overall. We ordered Ayam Bertutu and Nasi Campur Waterlily. Both came with the standard side dishes of Kangkung (Water Convolvulus) Belacan, Rice, Keropok (crackers), small appetising portion of Long Beans and Turnip, Sambal Terasi and Sambal Matah. 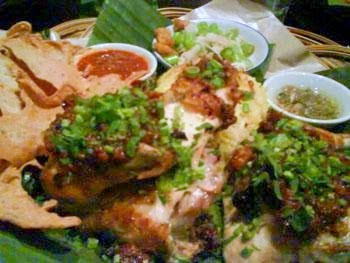 Ayam Bertutu, RM25, is essentially half chicken with a generous portion of lemongrass-base paste on it, and it came with herb-tinged yellow rice and the earlier mentioned side dishes. At first taste, the paste is really salty but as the palate acclimatises, it is a rather tasty dish. The Keropok is a little hard, as opposed to being crispy. 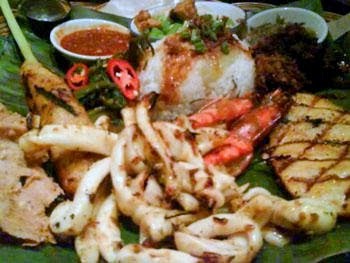 Nasi Campur Waterlily, RM33, is a mixed platter of seafood and meats, with tender-grilled Sotong, juicy Prawns (two to be exact), one Sate Lilit (minced seafood clinging onto a strand of lemongrass), Fish Fillet and a choice of Beef or Chicken Rendang. The Beef Rendang did not fare as well as the grilled variety. The Nasi Campur comes with white rice, unlike the Ayam Bertutu. The Sate Lilit, which almost tastes like Otak-Otak (fish paste cake), is rather delightful and you could order more Sate Lilit for RM15, which gets you 4 sticks. 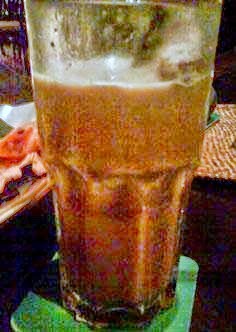 We also ordered a tall glass of Ice Blended Pulut Hitam (Ice Blended Black Rice Pudding), RM9, which is likened to pulut hitam flavoured ice cream potong (square shaped ice cream on a stick), but blended. This drink is worth a try, and is quite a filling choice. They do provide pandan-flavoured water for free, which is a nice touch. You could opt for mineral water, but that’s not free. 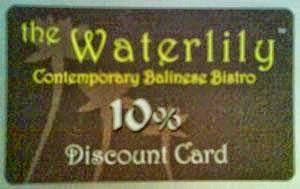 Waterlily Bistro does not serve pork, but they do serve selected alcoholic beverages. Our bill of two Ayam Bertutu, one Nasi Campur Waterlily and one Ice Blended Pulut Hitam amounted to RM101.20 (including service charge). They presented us with a 10% Discount Card, which was a nice way to end the meal! Opens daily from 11am till late.